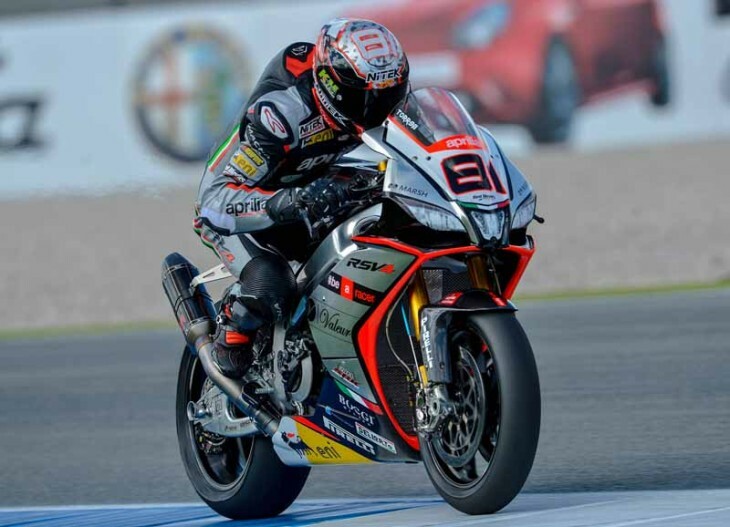 Assen (Holland), 17 April 2015 – The first day of practice at Assen had the Team Aprilia Racing – Red Devils riders improving in leaps and bounds between the two sessions. More than one second improvement for Leon Haslam and an impressive second and a half for Jordi Torres are a symptom of the excellent job done in the garages on the Aprilia RSV4 RFs, a process that will continue today with the customary technical debriefing which should lead to more results tomorrow and in the races on Sunday. The demanding Dutch track was unable to intimidate expert rider Leon Haslam who concentrated on the job at hand without pushing too hard, leading his mechanics in the right direction. The improvement in the two timed sessions and especially the feeling Leon had on the bike are encouraging for Superpole tomorrow and the races on Sunday. Haslam rode his RSV4 RF to fourth place in the combined standings with his best lap stopping the clock at 1’36.48. One of the particularities of Assen is that there are no real reference points. It is a flat track where any mistake setting up a line can penalise the rider for an entire sector. Precisely for this reason Jordi Torres, in his rookie year on the Aprilia V4 reigning world champion bike, had to adjust his braking points and adapt to the Superbike lines. This was the focus for the morning session, where Jordi put in a lot of consecutive laps precisely to get comfortable on the track, whereas in the afternoon he concentrated on the actual setup, ending the day in sixth place.